My goal is to post 28 of these interviews before August 29th. That means 20 more posts in 16 days! Will I make it? Even if I don’t, the project has already been so worth it. I’ve affirmed some things I already knew about my own community. I’ve gotten late night emails that make me laugh out loud or tear up at other people’s memories. I’ve pushed myself to reach out to people I don’t know very well, just because I’m curious about their lives and hope to deepen my relationships with them, and really, the worst they can say is no. And of course, lots of people haven’t come close to saying no. Today’s interview is with someone who has said “yes” to all kinds of things: yes to a marriage proposal on 09/09/09 and then a bowling alley wedding on 10/10/10. Yes to experiences away from her home country that will broaden her perspective; to nascent, undefined work projects because the idea-germs within them are just too intriguing for her to ignore; to publishing her nonfiction online and reading it in front of strangers; and, sweetly, yes to this project. Everybody, meet Celeste. Julia: Does the term “Saturn returns” mean anything to you? Celeste: No, but it reminds me of snooping as a pre-teen in my mom’s closet and finding Linda Goodman’s Love Signs book. I’d leaf through its pages thinking about the boys I had a crush on and seeing how they paired with Capricorn, my astrological sign. I wanted tips on how to make them mine, but being the gangly freckled-faced girl I was, our stars never aligned. J: Where were you when you turned 28? C: In Buenos Aires. It was January and my boyfriend-turned husband Craig and I had just moved to Argentina after begging Idealist to let us work there for a few years. For my birthday, we went out to eat at an extravagant Indian restaurant where we ate and ate and ate. When we walked out, bellies stuffed with dosas and curries, we saw a small child in his underwear sifting through garbage with his cartonero parents. It made me ill to see; I couldn’t believe we had just been so ignorantly luxurious. 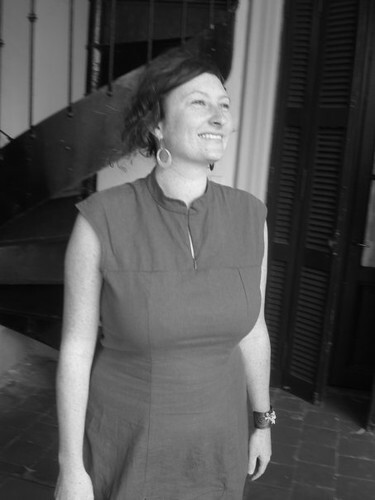 I knew from this moment that Buenos Aires was going to be a different a experience than Peace Corps Guyana, where I had spent my early twenties steeped in idealism, the focus on everyone else besides myself. J: What are one or two or three things you remember from the year or so surrounding that birthday? C: My father had passed away the year before, and it was an ugly death rife with family drama worthy of a Lifetime movie. When I turned 28 I was closer to forgiving all that had happened and the people involved, including myself, but there was still some healing to do. Moving to Buenos Aires allowed me the distance that grief sometimes needs. I knew Buenos Aires was going to be the last adventure Craig and I would have for a while, as we had plans to get married and have kids once we returned. I’d often have pangs of nostalgia, in the moment while talking to a friend, as if I had already left the country. I could profoundly sense that those few years in Buenos Aires were never going to be recreated. My father’s death had also reminded me of how incredibly fortunate I was to have life still cradling me in its arms, allowing me the freedom to discover, travel, learn, grow. J: Do you feel close to those memories, or far from them? C: Those memories are at once deep inside me, but belong to a younger me who I’m not sure I recognize anymore. I’m 32 now, living in a house in Portland, Oregon with a husband and nine-month-old baby. I continually struggle with this new facet of my identity, the part that tells me I can’t just up and go to a concert or sleep in until noon or book a flight to the end of the world. Yet. I like going to bed early. My father’s death no longer haunts me. I eat choripan at a nearby Argentine food cart and I am nostalgic, but it quickly passes. J: Do you have any advice for someone going through this (supposedly) astrologically tumultuous time? C: The year I turned 28, the gap of who I thought I was going to be as an adult versus the reality of who I was made me panic for short time. I felt like a failure. Then I remembered all I’d accomplished over the last decade, all the amazing people I’d met, all the plans for my future. I still had time to write a book. Live in another country again. Make a difference. So, 28-year-old. Redefine. Rediscover. Reinvent. The possibilities are endless. Love love love you, Celeste. Thanks for being a part of this. 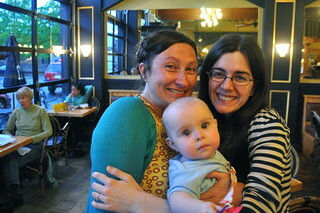 Photo of Celeste in Buenos Aires around age 28 by Pablo Tiscornia; photo of Celeste and her daughter Hattie and me this spring by one of our pals in Portland. Previous “28 in 29″ posts: Intro; Hannah, #1; Kara, #2; Saya, #3; Cathy (aka Mom), #4; Rachel, #5; Jen, #6; Cathy W., #7. This entry was posted in People, Projects and tagged 28 before 29, buenos aires, grief, possibility, saturn returns. Bookmark the permalink. ← 28 before 29, #7: Cathy W.